Following his first trip to the Rocky Mountains [47.1202] in 1859, Albert Bierstadt returned to the western United States in 1863 with his friend, the author Fitz Hugh Ludlow. Both men were tremendously impressed by the splendor of the landscape. Ludlow published his assessment of the scenery in the June 1864 issue of Atlantic Monthly, proclaiming that the Valley of the Yosemite in California surpassed the Alps in waterfalls and the Himalayas in precipices;Bierstadt wrote of their trip to his friend John Hay that he had found the Garden of Eden.The popular orator and preacher Thomas Starr King extolled the virtues of Yosemite and considered those who depicted its scenery to be artist-priests. Bierstadt effectively combined his studio training abroad and his facility for sketching outdoors, successfully cultivating a market for western pictures back in the East. He painted this small, finished oil sketch, probably his first of the subject, in his New York studio the year after his trip to Yosemite, and sold it at the Metropolitan Sanitary Fair in New York for $1,600, the highest price paid for a painting at the sale. Small-scale oils like this one, which has the freshness of studies executed in the field, also served as inspiration for compositions the artist envisioned on a grand scale and painted in his studio. 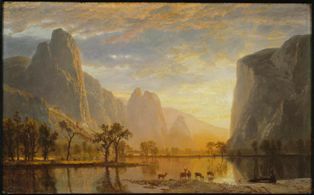 This work is likely a finished sketch for the much larger (five by eight feet; 1.5 by 2.4 meters) Looking Down Yosemite Valley, California (1865, Birmingham Museum of Art, Alabama), painted the following year. Bierstadt became known for such panoramic canvases, particularly his grandiose scene TheRocky Mountains, Lander’s Peak (1863, Metropolitan Museum of Art, New York), which measured six by ten feet (1.8 by 3 meters). By late in 1865, after it had toured the Eastern seaboard, Bierstadt sold that canvas for $25,000, setting a record price for an American painting. 1. Fitz Hugh Ludlow, “Seven Weeks in the Great Yo-Semite,” Atlantic Monthly 13, no. 80 (June 1864): 739–54. 2. Albert Bierstadt to John Hay, August 22, 1863, John Hay Collection, John Hay Library, Brown University, Providence, R.I.
3. Nancy K. Anderson and Linda S. Ferber, Albert Bierstadt: Art and Enterprise (New York: Hudson Hills Press, 1991), 80.